Diamond Crater or Crater of Diamonds is located in The Natural State Park of Arkansas. This Natural State Park is a tourist attraction, where the public can go, search for real diamonds and keep the diamonds they find, regardless of their value. The Park was opened to the public in 1972 after the state of Arkansas purchased the land for a state park from General Earth Minerals of Dallas, Texas. The History of the Diamond Crater began when word got out that there were diamonds in Murfreesboro, Arkansas. The Tent City of Kimberly was established between Murfreesboro and the diamond field, today it's no longer there. The Diamond Crater is a diamond mine and a 160-acre McBrayer Family Farm purchased by John Wesley Huddleston in 1906. Mr. Huddleston found the first diamonds on his land in Pike County, west of Murfreesboro, Arkansas in August, 1906. Huddleston sold his diamond-bearing land for $36,000. In 1976, Huddleston became famous and nationally known as 'Diamond John' or the "Diamond King", according to Howard Millar's book, "It was Finders Keepers at America's Only Diamond Mine". The Arkansas Diamond Company was started by the men who bought Huddleston's property, but, 40-acres of the land was not owned by Huddleston. It was owned by M. M. Mauney who refused to sell his land. Later, he sold 3/4 interest to Horace Bemis who organized the Ozark Diamond Corporation. Shortly there after, Bemis died and his heirs weren't interested in diamond mining. Bemis' share was purchased by Austin Millar and his son Howard. They tried to buy out Mauney's 1/4 share of the diamond mine, but, Mauney refused to sell. A small commercial plant was built and successfully operated by the Millars. In January 13, 1919 the entire commercial plant was destroyed by arson. The Millars never could rebuild it. Howard Millar leased the land in 1951 and it was opened to the public as the Diamond Preserve of the United States. The name was changed to the Diamond Crater later. Although, the first attempt to make the diamond mine a real public attraction occurred in 1949. Howard Millar and his wife operated the tourist attraction successfully. The property close to the Diamond Crater was owned by Mrs. Ethel Wilkinson of Logansport, Indiana. She named her property The Big Mine and opened it to the public. A fierce billboard competition, advertising the two tourist attractions, started with each attraction's billboard claiming to be better than the other. In 1969, both properties were bought by the General Earth Minerals of Dallas, Texas. General Earth Minerals continued to operate the properties as a private tourist attraction, but, never as a commercial mine. In 1972 the State of Arkansas bought the land for a state park for $750,000. The Diamond Crater is the only Natural State Park in the world that produces diamonds that can be searched by the public. Famous diamonds have been found at the State Park by visitors and tourists. The Strawn-Wagner Diamond by Shirley Strawn in 1990. This diamond is on permanent display at the State Park. It weighed 3.03-carats in the rough. Arkansas's first certified gemologist named, Bill Underwood recommended that the diamond be sent to Lazare Kaplan International of New York for cutting. The diamond was cut into a perfect 1.09-carat, round brilliant shape, featuring the "Ideal Cut." A perfect diamond cut allows for the maximum amount of light to be reflected one facet to another and up through the top. The diamond was certified in 1998 by the American Gem Society. It's a perfect diamond that weighs over a carat after cutting and this perfection is estimated to occur one time in a billion. 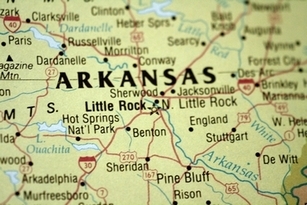 It was handcrafted by Underwood's Fine Jewelry of Fayetteville, Arkansas, by mounting the diamond on a pure platinum and pure 24-carat gold ring, symbolic of Arkansas the "Natural State." The platinum shank has a thin gold inlay in the middle and the two gold apple blossoms on each side of the crown represents Arkansas's state flower. The "Uncle Sam" Diamond discovered in 1924 at the diamond mine in Arkansas, is the largest diamond ever found in North America. It is a 40.23-carat white diamond named after its finder W. D. Bassum, nicknamed, "Uncle Sam." It was cut twice over the years, with the second cutting resulted in a 12.42-carat, emerald-cut gem. The "Kahn Canary" Diamond was discovered at the Diamond Crater State Park in 1977 by George Stepp, a logger from Carthage, Arkansas. This 4.25-carat "Kahn Canary" was formed by Nature into a perfect dodecahedral (a solid figure having 12 faces), pillow shape with a vibrant yellow color, called "canary" in the diamond industry. Later, Stan Kahn of Pine Bluff, Arkansas purchased the diamond from Mr. Stepp. The First Lady Hillary Clinton wore the "Kahn Canary" Diamond at her husband, President Clinton's Inaugural galas in 1993 and 1997. She wore the diamond as a special unique way to represent Arkansas. Stan Kahn loaned the diamond to Mrs. Clinton. The diamond is often on temporary display at prestigious museums, diamond and jewelry exhibitions around the world. It is still in its natural raw form and has been left uncut because of its flawless natural beauty, which captivates its viewers. The "Amarillo Starlight" Diamond was the largest diamond unearthed by a visitor at the State Park in 1975. W. W. Johnson of Amarillo, Texas found the diamond while on vacation with his family. The diamond was 16.37-carat white gem, before it was cut into a 7.54-carat marquise shape. There have been many diamonds found at the Diamond Crater by visitors and tourists, but, these four diamonds are the most famous and much publicized of all the notable diamonds. The Diamond Crater features a 37-acre field of diamond soil that is plowed periodically when weather permits it. The plowings are unscheduled. The park is opened year-round except on New Year's, Thanksgiving and Christmas. Visitors enter the field through the visitors center that offers exhibits and an A / V program explaining the area's geology and history. The Park staff provides free identification and certification of the diamonds. You don't have to bring equipment to the park for diamond searching, you may rent or purchase tools there. The clothes that you and your family will want to wear when searching for diamonds are, if it's wet, you will need some old shoes or boots because the field will be very muddy. If it's in the summer, a hat and sunscreen to protect you and your family from the sun. When searching for diamonds, depending on your time or how hard you want to work, there are three methods at the Diamond Crater. Surface searching consists of walking up and down the roads of dirt looking for diamonds lying on top of the ground. It is a more productive type of search following a hard rain. The rain washes the soil away leaving the diamonds, rocks and other minerals exposed on the surface. The second method is digging for diamonds deep through the first six inches to one foot of soil. Visitors turn the soil over with a small hand tool while looking in the loose soil. Some visitors use a screen to sift the soil for diamonds. The third method for diamond hunting requires a lot of hard work and experience from previously searching for diamonds at the park. This method is usually preferred by repeat or regular visitors. It involves digging deep holes, removing the right type of soil, washing the soil and patiently hand sorting through concentrated gravels to look for small diamonds or tailings, which are waste gravel that went out of the plant from the earlier commercial mining plants of the 20's and 30's. Some diamonds you find can be very valuable if they are large and need to be cut. The park staff can identify diamonds found in the field, but, are not trained nor have the equipment to assess the value of the diamonds, however, if your diamond is large and needs to be cut, the staff will give you the names of diamond cutters. Most diamonds found are generally too small to be cut. 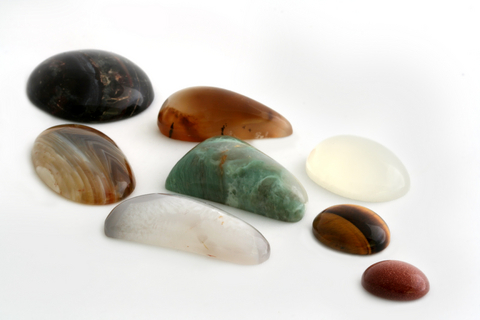 They are typically smooth and well-rounded with shapes resembling a polished stone with smooth sides and rounded edges. The average size is about the size of a paper match head, approximately 20-25 points, an increment of measurement of diamonds. A carat in a diamond is 100 points. A diamond of 1-carat is as small as a green pea. The diamonds feel like they have an oily film on them, they have a metallic luster like new steel or lead, they are translucent where you can see into them but not through them and their colors are white, yellow and brown. The small diamonds are usually mounted uncut on jewelry. Mounting the small diamonds in a pendant and worn around the neck is the most popular way to display an uncut diamond in the rough. They are valued souvenirs of your trip to the Diamond Crater. There are places to stay if you and your family are planning to travel to see the Diamond Crater. You'll find all of these lodgings with hot deals and vacation packages near Arkansas Natural State Parks and the Diamond Crater. There are other beautiful attractions at the Natural State Park also, such as, Hot Springs Natural Park, the country's first national river, federal and other parks.